Every few days I get notices on my MacBook that it's running or run out of hard drive space. Curiously, restarting the computer will enable me to recover gigabytes of space (this past time, it was able to recover about 2.2GB). However, I can't identify anything in my personal activity that consumed that space. It's possible that it's a rogue iTunes podcast or a huge software update that my Mac is automatically downloading - would either of these reclaim the space upon a restart? One possibility that I can think of is that FileVault has some sort of disk leak, allocating but not freeing files. Does this make sense? Is there a tool that I can run to determine where this space is going? Assuming it is FileVault, should I try to disable it? What's the best way to turn of FileVault on a nearly full computer? DaisyDisk is sort of like WinDirStat for Windows, in that you can see your files as a visual hierarchy and find out which ones are taking up the most space. Credit to Sathya for his answer in Super User. I've had a very similar issue, and so I decided to compile several methods for solving it. So, following, there are those options and some of them I got from the answers already provided here. I understand this is a little bit offtopic from the question, but it's in tune with the answers. This has many parts and those are all softwares I could try myself somehow. It's generally a good idea to pay close attention for using the sudo options below so the software can have access to every file, which will likely include some big hidden ones. GrandPerspective is only graphical, using the Treemap, it can measure files by logical or physical methods before scanning, show/hide package contents and change color scheme on the fly. It also is able to save the scanned data for archiving or comparing multiple windows. 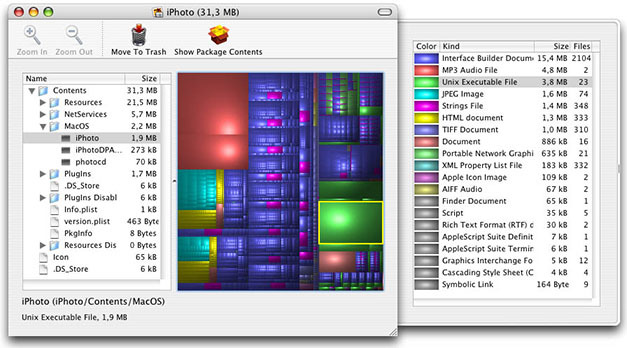 Disk Inventory X also uses the Treemap graphical scheme but along side a list view of folders and files. The grahpics isn't as good as GrandPerspective neither the list as good as OmniDiskSweeper, but it does a good job mixing both. It has a Finder plugin and the most options between the 3 on preferences. It's the most complex, but not all complete. 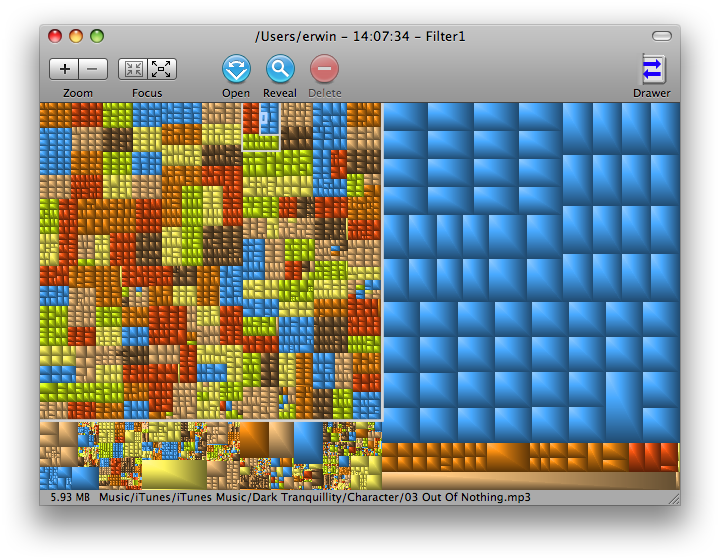 OmniDiskSweeper is non-graphical and very similar to Finder's column view. You choose the folder or disk to analyse, it will order them by disk usage after taking its time to calculate. You can then just delete (move to trash) anything listed. So each one has its advantages and highlights, I'm still not sure if there's one that comes on top. They're all free. There is also a different approach, of apps for scanning specific expected places and files for space usage in non-optimal ways. They basically gather some known things about the system that can be bloating your disk all in one nice interface so you can see and decide what to delete. 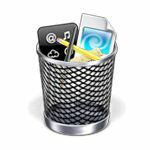 CleanMyMac lists caches, logs, language files, universal binaries, development "junk", extensions and applications. It scans through the files and also uses some knowledge base it has. Great interface, simple to use. CleanApp is basically the same as CleanMyMac: lists applications, preference panes, languages, caches... But it also adds community to it - shows how many people deleted each file or bundle. There's yet another feature, the logging, which logs for activity of moving files and running apps, and all the "links" it can find for each thing. It's much more technical and detailed. It also offers a Treemap kind of view, but I'd highly advise using another option for that. XSlimmer is very specific. It remove "unnecessary" code from "fat" binaries and Strip out unneeded languages, as it says on the website. Universal Binaries, that is, use a lot of space for storing files to run in several different architectures and languages. So, this strips all of them to shrink to only your computer needs. AppCleaner is a free option here, lists just Applications, Widgets and "Others". Has a simple interface where you can drop an App file so it will analyse its inside links and delete stuff left behind outside the bundle based on that. Another approach is looking for duplicate files. There are many commercial options, some may be better than the listed below, I haven't tried them all. Anyway, I'm listing my choice of apps considering which ones I was able to try. TidyUp is a very well known app in this subject. You can specify where to scan for what kind of duplicates. It offers basic and advanced modes, several different strategies and criterias. MrClean is a free tool that just scans for folders for duplicates and trash them. Very simplistic but efficient if you're sure on what you're doing. Chipmunk scans duplicates and let you choose which ones you want to trash. It offers a node-view of folders and you can select to "delete all files in a folder that have duplicates elsewhere, or vice versa" as well as hand-picking. It may take very long to scan all files, but it does a very decent job after that. 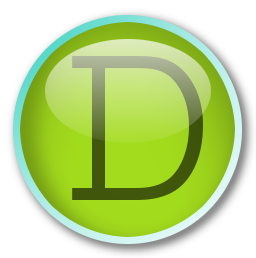 DupeCheck "drop a file on it and it will use your Spotlight index to see if you have a potential duplicate somewhere." That's about this nice open source app. Not a great tool for space cleaning at once, but over time it helps you keep your space clean. DuplicateFileSearcher from the website: "is a free powerful software utility that will help you to find and delete duplicate files on your computer. It can also be used to calculate MD5 and SHA hashes. The software runs in Windows, Linux, Solaris and MacOS.". Enough said. Next I'll briefly discuss on a similar approach by quoting relevant parts about two other things that can be done to look for missing disk space, without installing anything new, just using the command line (the Terminal). In most cases, there really are files occupying part of the volume, but the files are invisible in normal use of the Finder. The /private/var/vm directory contains the swapfiles used by virtual memory. New ones are made as more data is swapped from RAM to the hard drive. The entire process of creating them begins at each reboot or restart; do not attempt to remove them yourself. Check the total size of all the swapfiles, right after you boot, and as the disk fills up. In Panther, the first two swapfiles are 64 MB, then each new one is twice the size of the preceeding one (128 MB, 256 MB, 512 MB, 1 GB) up to a maximum size of 1 GB. In Tiger, the first two swapfiles are 64 MB, the next one is 128 MB, and any additional swapfiles are 256 MB. If you do not run the daily, weekly, and monthly maintenance scripts (either by using a utility, or by running the commands sudo periodic daily, sudo periodic weekly, and sudo periodic monthly in Terminal), the logs on the startup volume can become too large. If an error is occurring frequently and is being logged, you can have a very large file at /private/var/log/system.log. The files in /Volumes should be aliases to your mounted volumes. Do not remove these aliases, because anything you do to them happens to the contents of the corresponding volumes. If you are not confident that you can explore this folder without mishap, before you begin, properly unmount any volume other than the startup volume, if the missing disk space problem affects only that volume. External FireWire drives can be disconnected after proper unmounting. Sometimes, backup programs that cannot find an intended destination (or target) volume for a backup create a folder with the same name as the destination, and put the folder into the /Volumes directory. There are cases in which the entire startup volume has been backed up on itself, in a folder inside /Volumes. If the amount of missing space is about the size of your user folder, such a backup is likely to be the explanation. If you use Carbon Copy Cloner or another backup or cloning utility and have its preferences configured to create a backup on a schedule, and the intended destination volume is not mounted or is sleeping at the scheduled time, the backup is created in the /Volumes directory. The /Volumes directory becomes visible in the Finder; find its size by selecting it and typing Command I. My /Volumes directory is reported to be 12K. You may want to run a du in terminal to see what is all going on. This could take a few minutes to run. Input your password when it prompts for it then let it go, it will take a few minutes to run so be paitent. Adding to the command line option, you could use an automator service for opening any app. With this you will get different (and more complete) results on GUI. Or, if you're on a Power PC, using Rosetta or anything before Snow Leopard, you can mix any of the before mentioned apps with Pseudo. It's a little app to open things as admin. Picture it like a GUI for sudo. Finally, there's a complete newbie guide on "The X Lab" that I just won't quote here for it's too long. 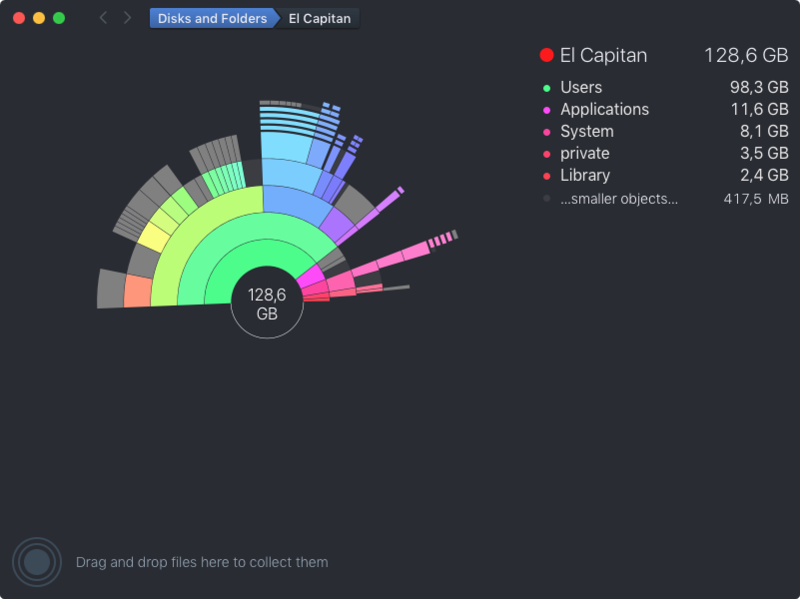 Disk Inventory X is another excellent disk space visualizer. FileVault or any other third party software is not necessary at fault here. Do not ever mess with OS X's caches and swapfiles. The cache gets flushed when booting into SafeMode and gets recreated during normal boots. In short, that's simply disk space overhead to run OS X. You can't really recover or control the cache. 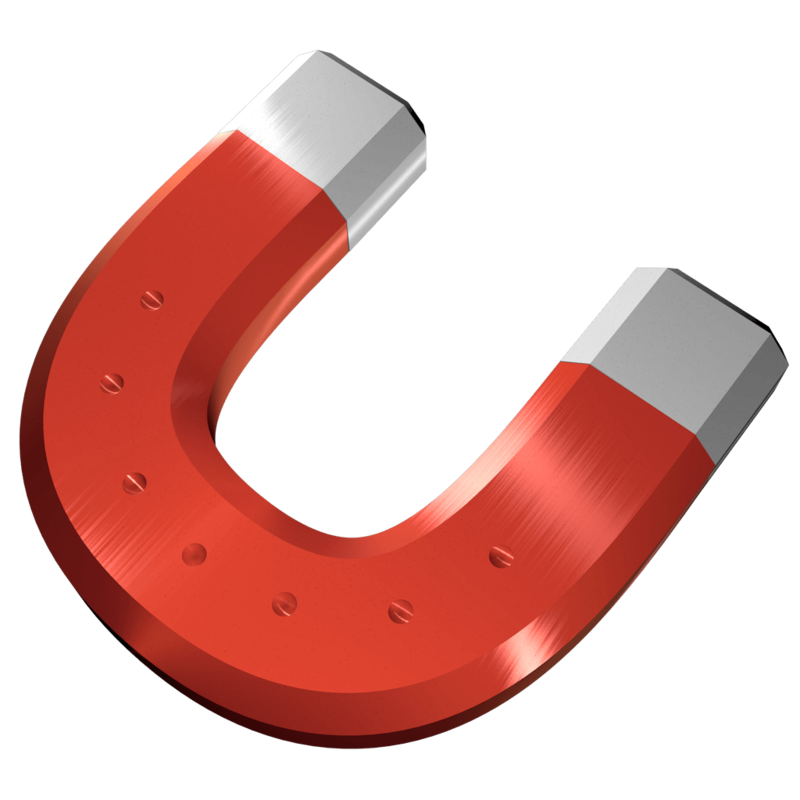 Someone at macfixitforums.com has kindly compiled a list of usual suspects that snatches disk space in Mac OS under the posting Where Did My Disk Space Go? Run this before and after the reboot and you should be able to see what the big differences are. It sounds like the space recovered is from your swap (vm) and sleepimage files. Restarting will clear the files in /var/swap/ which can grow considerably if you're running out of RAM or are using a laptop. If you are using a laptop you'll find a file called sleepimage that is the size of the amount of RAM you have installed and it can be safely deleted - that said deleting anything from here is temporary. If you need more space than I suggest using applications (as suggested) like Grand Perspective or Disk Inventory X to find large files. You can also remove additional language translations by hand or using an application like Monolingual - for example as an extreme iWeb drops from nearly 1GB to ~150MB after running Monolingual. If you want to turn off FileVault you can follow Apple's instructions: by simply unchecking FileVault in the Security Preference Pane in System Preferences. You don't need any tools if you care to use Apple's included tools. Start with System Information and the About this Mac Menu bar item in the Apple Menu. Tick the Calculate all sizes check and then use the triangles to expose folders and keep track of what folders are growing as you use the Mac over a 20 minute period. You can also inspect the filesystem raw access with fs_usage in the terminal app, but it's a bit like trying to take a sip from a fire hose. If you can narrow down a process or a folder to search for with grep the filesystem activity becomes more helpful and useful to know what's happening at the lowest levels of filesystem access. One more free and useful Mac disk space utility from The Omni Group, OmniDiskSweeper. In Mac OS X 10.7 Lion: the Ars Technica review (page 18) (2011-07-20) there's perception of an overlap, a description of something as suboptimal, and talk of copies. The notion of local disk space being used for copies may be understandably alarming — "copying something takes time, places load on the CPU" and other such thoughts. I suspect that Lion's use of NFS for Mobile Time Machine local snapshots will prove to be not comparable to copying, in that sense. Suspect a very intelligent use of space that involves neither copying nor movement of files — the magic done at catalog B-tree and related levels on the HFS+ volume, and at some level in mtmfs. Could not determine an appropriate HFS+ volume from "/Volumes/MobileBackups". The file system type of /Volumes/MobileBackups is 'mtmfs'. To sum up: after initial concerns are set aside, most people should find local snapshots to be a good thing, with an impact on performance that is either imperceptible or negligible. In more modern versions of the operating system, use of bands for FileVault 1 should be not problematic. AFAIR space is freed dynamically, without the need to log out. Whether free space was as well managed with FileVault 1 two years ago, when the question was posted, I can't recall. It looks like FileVault can cause some issues some issues with free space. Unless you really need the integration that FileVault provides, I would suggest disabling it and using TrueCrypt instead. It is open source and will not crazily eat up free space. You can also check out this guide on how to free up hard drive space on OS X or run a disk usage disk utility (such as one Doug Harris suggested). 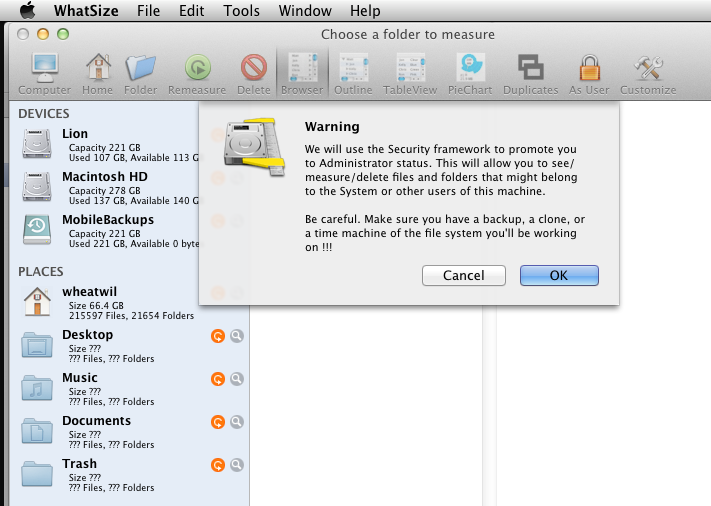 Edit: Since originally answering, FileVault has been significantly overhualled in OS X Lion and is much more reliable. This command finds all the individual files whose size is greater than approximately 100MB and then prints them on the terminal. In my case there was a tomcat log file which went to whooping 13GB. is a disk space visualizer that costs US $13.00. While similar to other programs described above, it also has a mode wherein you can see, measure and even delete files that belong to the System or other users. I used Disk Inventory as did many others here and found I found multiple files of iphone and ipad backups. As I drilled down into it, I discovered that I had 4 Gb of backups that were two years old for older devices I now longer used. This was a nice find on my 128 Gb Hard drive. If you've had multiple devices on your mac, check ~library/application support/mobilesync/backup. Each backup is in its own folder and the out-dated ones will easily stand out. Try the app disk cartography it's completely free and it shows hidden systems.You can also make it show files greater than 1 Gb etc. "Restarting the computer will enable me to recover gigabytes of space" is not curious at all; afaik, it is software flushing its caches. For me as a heavy firefox user (100+ open tabs), rebooting my MacBook frees something in the neighborhood of 1 to 2 GB of disk space (which, subsequently, gets filled with new Firefox cache data). AFAIK there's other software with bloated caches; I remember from an earlier version of Mac OS X (Snow Leopard?) 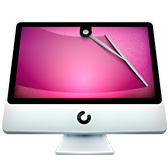 that QuickTime updates are somewhere stored in the Library and can be deleted. Not the answer you're looking for? Browse other questions tagged macos disk-space filevault . How do I find how much disk space a program is occupying? How to find Hard Drive capacity in Mavericks? What is consuming HDD space on my MacBook Pro? How can I figure out if a Safari extension is using unreasonable memory/cpu? How can I tell what is using disk space by category and monitor changes? Can any experts here figure out how to get Mavericks' Dock.app working on Yosemite? Old Mac Pro starts randomly hanging - how do I figure out what's wrong?